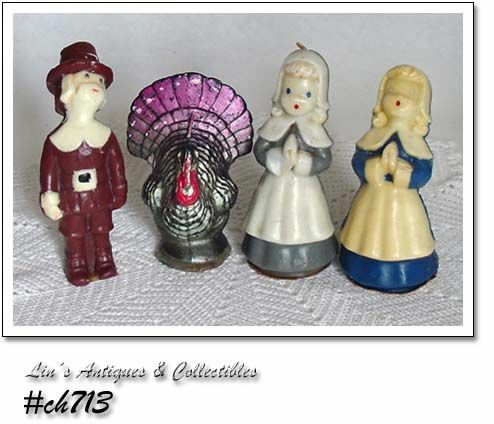 This is a nice Gurley candle listing-- a pretty turkey, 1 pilgrim boy, and 2 girls. The boy and the girl in blue dress have overheated and lean back so they’re looking up (they stand okay). The girl in gray has some storage evidence. 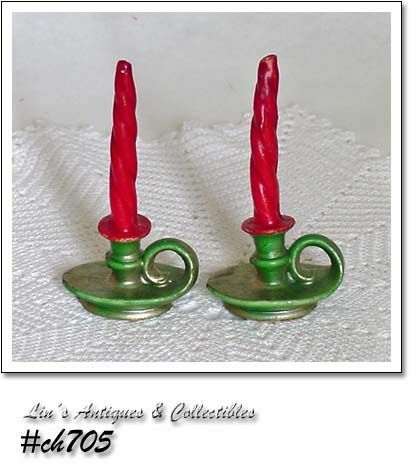 Candles are sold as is and are in the condition shown in photo. Another slightly overheated Gurley candle assortment! 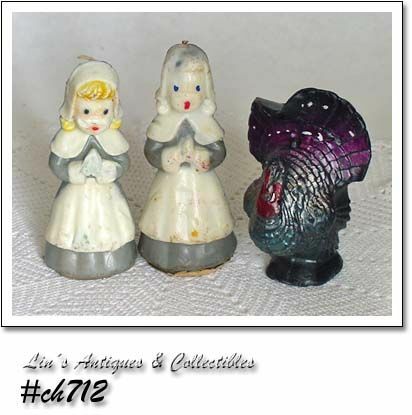 There are 3 in this listing – 2 pilgrim girls and a turkey. One girl has cardboard base while the other candles do not. The turkey candle is very nice but has a crimp in his tail and the girls have some flat places on them and some color from other candles. Candles are sold as is and the condition is as shown in photo. They are priced to reflect imperfections. 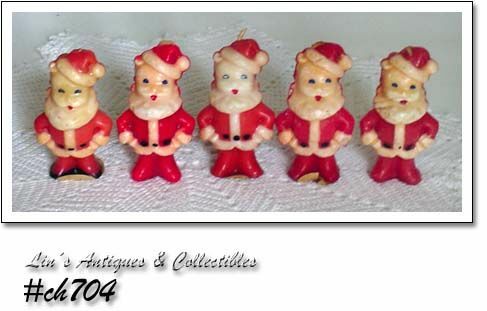 This listing has Gurley Santa candles! 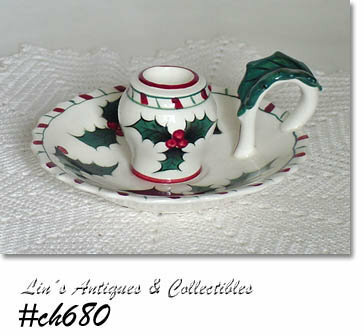 There are 5 in listing and all are in very good condition with minor storage evidence and color variations. Three have original Gurley cardboard bases while the other two have lost their bases/labels. Although slightly imperfect, these Gurley candles are still very cute! 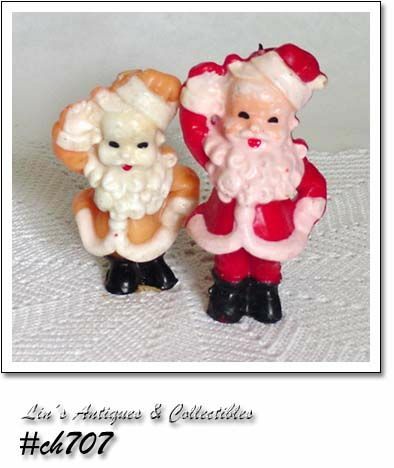 They’re waving Santa candles, one has faded from sun exposure, they have both gotten warm during storage and have some flat spots on backs, and they no longer stand on their own. The lighter color one has original Gurley cardboard base while the other one does not. These are nice Gurley candles shaped like lampposts! 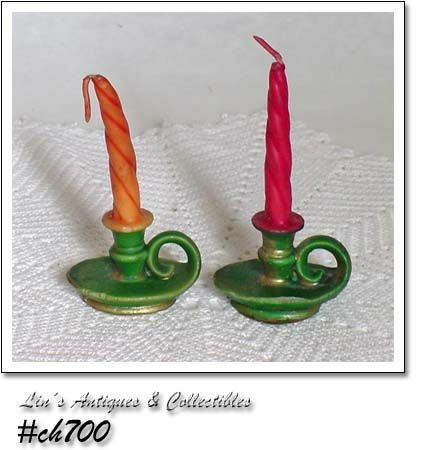 They are colorful candles and are in very good condition. Two have original Gurley cardboard bases/labels. 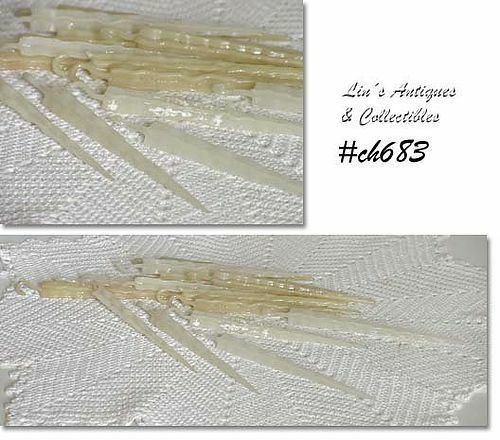 Another neat Gurley candle listing! There are 2 candles in chamber stick style bases. Candles are red, bases are green, and both have their original Gurley cardboard bases. 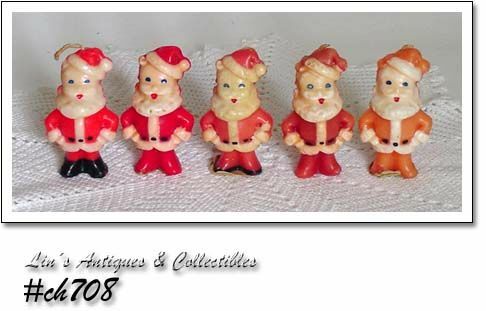 This listing has cute little Gurley Santa candles! 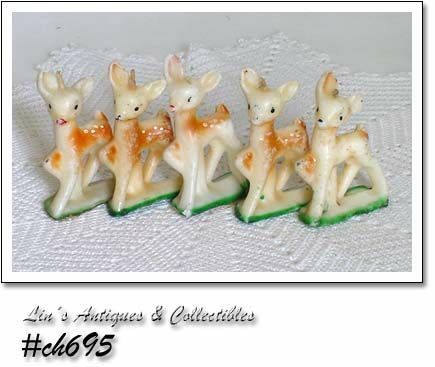 There are 5 candles in listing, 3 still have original cardboard bases, and each candle measures 3 1/8” tall. Candles have minor storage evidence and slight color variations. 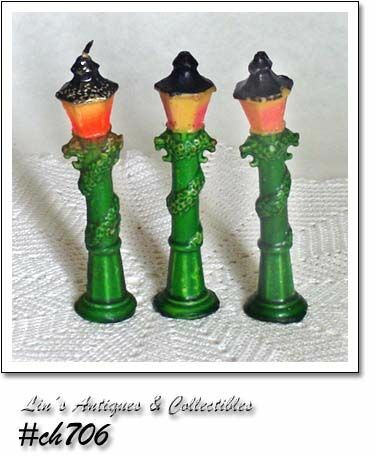 These are neat Gurley candles – they’re shaped like candles in a chamber stick style base! They measure 4 ½” tall, candles are red, “holders” are green – one candle has faded – both have Gurley cardboard bases. 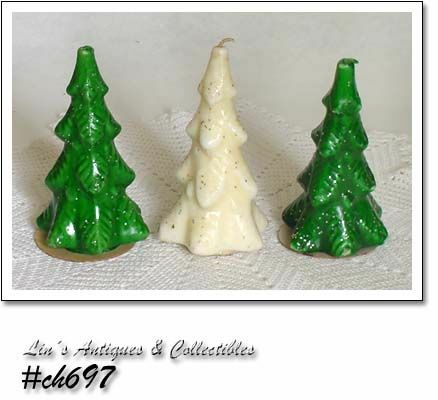 These Gurley Christmas tree candles are very pretty – there are 2 green trees and 1 white tree! Each has the original Gurley cardboard label/base and all are in very good condition – 1 green tree has slightly overheated and leans a bit -- that's it! 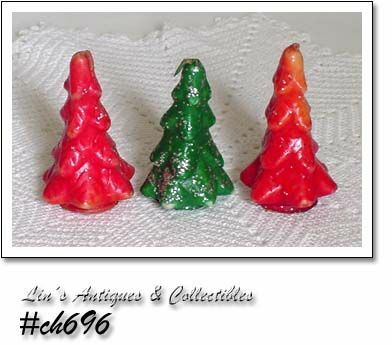 This listing has 3 small Gurley Christmas tree shaped candles! They measure 3” tall, there are 2 red trees and 1 green tree, and each has the original Gurley cardboard label/base. These are cute little Gurley candles! There are 5 in listing, 2 have cardboard bases, 3 do not. All have evidence of storage and one has a broken ear tip. They are priced to reflect imperfections. 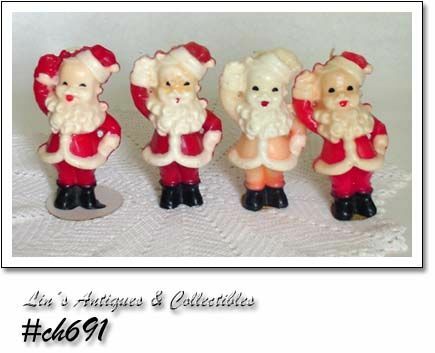 There are 4 Gurley waving Santa candles in this listing! All measure 5” tall, two are in excellent condition with bright colors and Gurley cardboard bases. Two have imperfections: one has been displayed in a window and colors are faded (especially on front), still has Gurley base, the other one has bright color but has wear to facial color and has lost its cardboard base. Wow – these are beauties! 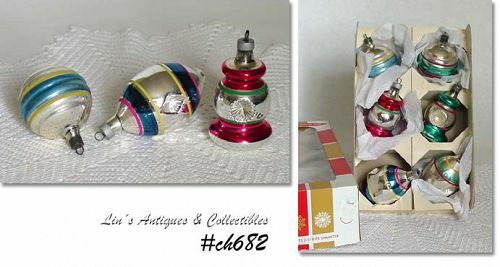 There are 9 ornaments in their original box – 3 reflectors drop shape with points, 3 round reflectors, and 3 round shape. All are colorful and in very good condition with very minor color loss – all reflectors are intact with no chips or breakage. Box is also in great condition but has lost the cellophane cover. 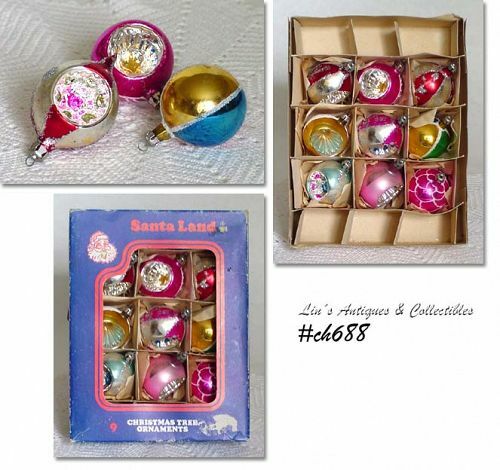 Please be aware -- there are no missing ornaments in this listing – they were 9 to the box as stated on front of box!